'Is Raat Ke Sannate Men' is a fantastic track, slightly reminiscent of the psychedelic marvels heard on Madan Mohan's superb 'Hanste Zakhm' from 1973. Rousing and hypnotic; it features an otherworldly melody, ominous horror effects, dramatic percussion and forceful guitar breaks – mesmerizing! It is however pretty much the only song that impresses me on 'Do Chehere'. 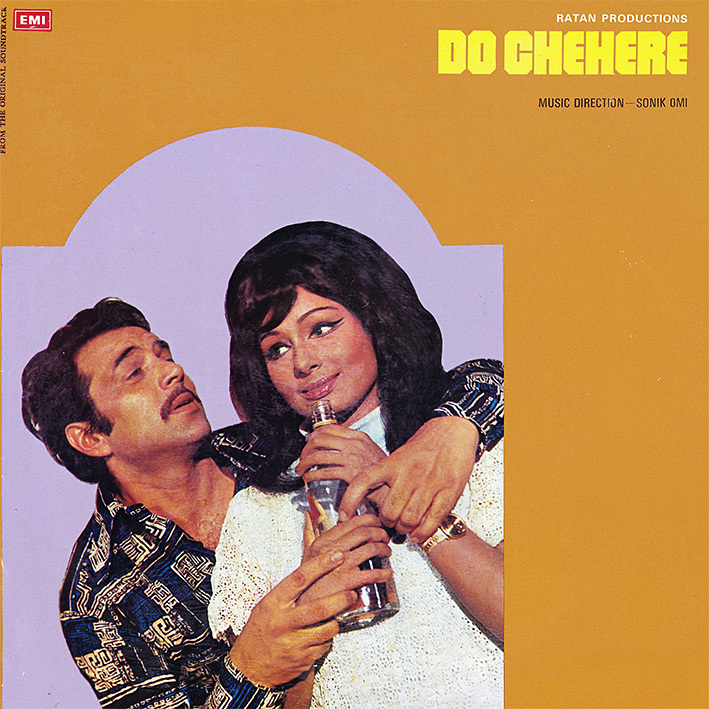 I confess a soft spot for Sonik Omi; they weren't the most original of duos yet I've many times found their often RD Burman-inspired soundtracks to contain plenty of worthwhile music. Occasionally forgoing the master's influence might have been a good idea, but what's left here is merely average. It's not that 'Mera Chhail Bhanwar Anguri Piye' and 'Chali Thi Thumka Deke Thaske' are actually bad songs, they're just a bit nondescript. Special thanks for Asha Bhonsle's song 'Is Raat Ke Sannate Me'. A rare gem indeed. Never heard before. Sound quality of the album very good. Nice to find you in the blog after quite sometime. Please share some RD Burman vinyl rips that U ripped a few years back. Dear Vikramji, LP is also great. Kishore Da-LP had lots of hits. Will be always exciting to hear these vinyl rips. I am a big fan of vinyl rips. U can send me any vinyl rip(LP,RD and others) at bts11@rediffmail.com .